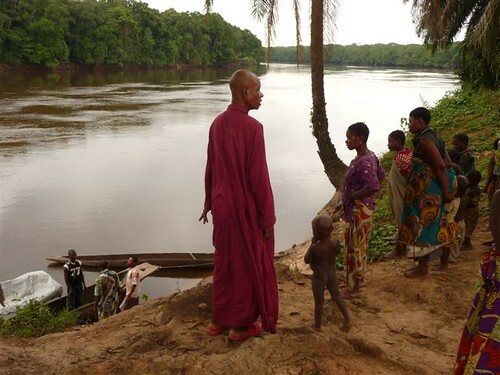 We had visitors at Camp Katopa, so John suggested a day-trip down the Lomami to the little village of Polepole on the west bank. Once a bigger village, now barely 15 huts, it is still the domain of Sheyh Musara. “Take him some coffee and sugar”, John advised, “he will be delighted.” John stayed behind to go over field notes while the rest of us, including our youngest daughter, Eleanor, with her boyfriend, Max, all piled into a dugout. Polepole was once a capital for elephant slaughter along the Lomami. I am not sure what the Sheyh’s role was in the killing. 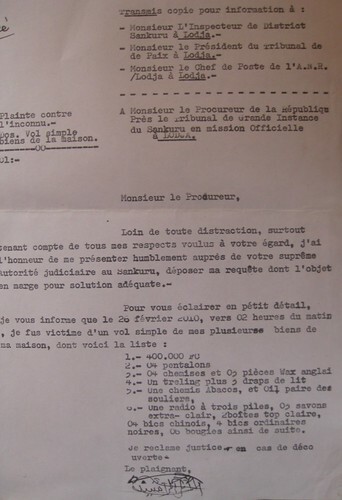 According to him he came to farm and raise goats, and he came after the execution of José le Maitre. Recently, however, the ravages of age have not dealt well with the Sheyh. 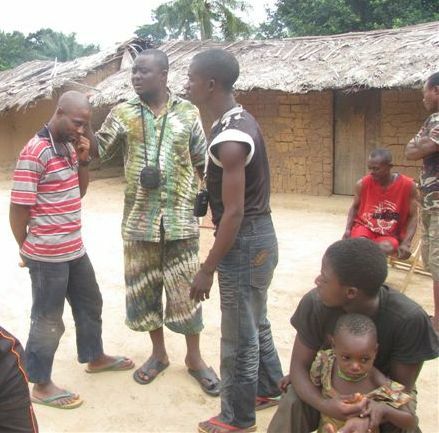 John took him north to Kisangani in our dugout in 2009 for a cataract operation. He was accompanied by his wife. 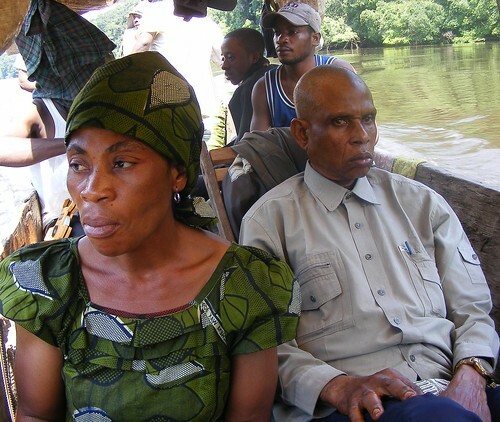 The Sheyh and his wife in our dugout headed to Kisangani last year. She is younger than him, but still at least forty years old. He returned a seeing man. 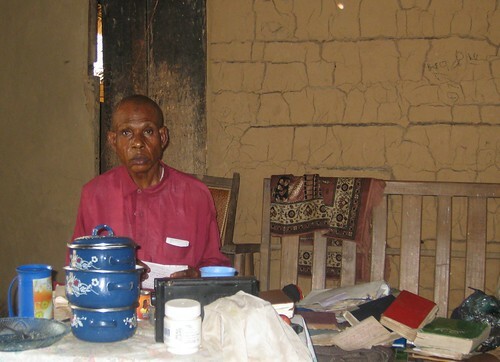 This was of great local importance as Sheyh Musara is one of the few literate men along the Lomami and the only one with a collection of books to prove it. His books were piled on the wooden bench next to him when we filed into his small hut after climbing the steep bank of the Lomami at Polepole. Sheyh Musara with his books to console him. He greeted us formally, squinting near-sightedly. Immediately we made him coffee sweetened with many generous spoonfuls of sugar. He was delighted. And slowly, one cup at a time, as water boiled in a little pot, we made coffee or tea for the rest of us as well. Sheyh told us his tale of woe: he returned a seeing man to Polepole, but soon had a multitude of other ailments ranging from rheumatism to ulcers. He needed treatment and undertook the long trip on the back of a bicycle to the major town of Lodja, stopping at his daughter’s along the way. She dutifully came up with the funds needed for a doctor and medicine. He continued to Lodja, where he stayed at a distant relative’s compound. The first day he bought some small gifts for his daughter and for his wife back in Polepole. That night he slept in the little room allotted him, with all that he had bought and nearly all that he owned. At two in the morning he had to make a trip to the outhouse. When he returned he found an empty room. Gone were the generous 400,000 FC for his medical treatment, gone were his pants, his shirts, his one pair of shoes, the cloth he had bought as a gift for the women, his little 3-battery radio, his soap, even his sheets and his candles. Alas. He suspected the son of his distant relative was in collusion with corrupt police. He wrote a very respectful letter explaining the sad case to the judge of the local tribunal. He waited and he waited for a full 40 days, but there was no response. He had no option, he returned to Polepole. A respectful, but futile letter. Here is what I think: he never had 400,000 FC (=400$) but perhaps 40,000 was stolen. Here is what we all know: whatever he had is gone forever and he will neither get it back, nor will anyone ever be punished. As the Sheyh was talking and we were sipping our tea, I watched Salumu and DeDieu talking with a young man (maybe 20 years old – no older) outside the door. He was gesticulating towards his head, DeDieu took a picture. Later as we all lined up for a photo with the Sheyh before leaving, all of Polepole jostled to be included – except this young man. Salumu examines the adulterer’s scars. As we stepped into the dugout and started the 3-hour motor upstream to camp Katopa, Salumu explained the young man’s story. It was actually the Sheyh’s second tale of woe, but one he did not tell us. The “mature” wife of Sheyh had taken an interest in the young man and apparently they had become covert lovers. They were about to run off when their plot was discovered. Thus the machete wound on the boy’s head. Thus the absence of the Sheyh’s wife…. As the dugout chugged slowly upstream and night came on, we mused about what it meant that the young philanderer stayed behind in Polepole with the old cuckold and yet the adulteress wife ran off. I was less certain. If the philanderer had been sliced with a machete, what did the Sheyh and his relatives do to the wife? I just hope that she managed to flee and find a relative who would take her in. The options for women are so small and so ephemeral in Congo. Nursing his Lodja losses, the Sheyh’s riposte would be that JUSTICE, itself, is too small and too ephemeral in Congo, but here its absence served him well. The Sheyh gathered his Polepole villagers to see us off, but neither the philanderer nor adulteress were visible. This entry was written by Terese Hart, posted on 2010-06-27 at 12:22 am, filed under uncategorized. Bookmark the permalink. Follow any comments here with the RSS feed for this post. Post a comment or leave a trackback: Trackback URL. You know what i love about this blog? It is such a wonderful example of how we treat animals is a direct reflection of how we treat other people and ultimately, how we treat ourselves…. It’s all connected and you show it… thank you.